I think I've written so many times about wanting to have our backyard landscaped! We have had zero luck with contractors over the past two years. Their vision and/or pricing has not been even close to what I had in mind. My husband and I had mentioned just planting trees and shrubs ourselves, but we were still thinking it over until a few weeks later when we noticed Houston Garden Center had 50% off all their plants. They have the sale every year and even discount them to 75% off in August. This sale is also how we landscaped our last backyard for cheap. It's not exactly ideal timing with the Houston heat, but if you're willing to sweat you can save big. We decided we were ready to sweat! When we built our pool a couple of years ago we added the Italian cypress trees behind the pool wall within a few months. They were a little thin and short at the time, but they have grown so much the past two years. The new landscaping is all along the fence line in the back. I'm hoping in the next year or two the plants will grow a couple of feet taller and wider so you don't even see the fence. We only addressed half the yard, from behind the hot tub to the side gate by the front of the house. It's the main area you see when you walk outside. I'm hoping we will landscape the other half next summer. I'm already going to start planning it out to get a head start! This is the starting point. I'll take you you on a little tour all the way to the side gate. We used Japanese blueberries and magnolia trees where we will eventually need privacy on the side fence (directly in front of you in the below photo). Hopefully, it will be a couple of years before the lot is sold and the house built so they have time to get big. 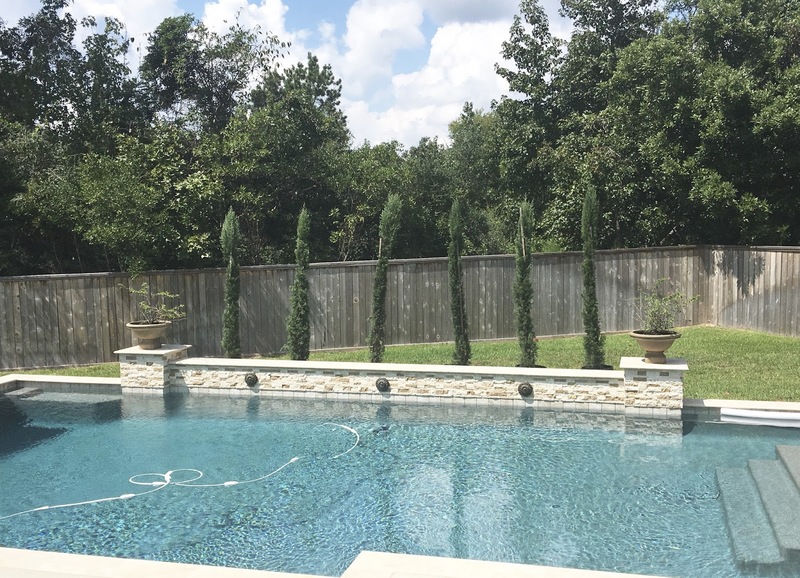 The area to the left (the fence behind the pool) will never have neighbors on that side so we used wax myrtles that will just cover the fence. I also added Texas sage that's a bit lighter in leaf color to add a bit of variation. It has a pretty purple flower that blooms in the spring and summer too. I like how the new flowerbed creates a little walking path in the back. We also added solar lights to the beds. They are only $10 each and it's so nice not to have to worry about using timers and electricity. It's also a no-brainer to install. You just stick it in the ground and switch it on. There's no lines to bury at all. My husband says he would eventually like to get real lights, but I think these are fine. They are bright enough and last all night. The view from behind the cypress trees. The side fences-The one with the magnolias is one side fence on the unbuilt lot. Their house will back up to the corner of our house on this small section. The one with the cypress trees is the second side fence. The other side fence. It's a strange shaped backyard with two neighbors on one side. Here's a close-up of the Japanese blueberries that will eventually reach 30 feet tall. They are about five feet tall right now. I'm hoping next year they will cover the fence. Then we start a line of cypress trees. These are what ours looked like when we planted the ones behind the pool wall. It's amazing how big they get! I'm not quite sure if these are going to stay. We were honestly out of options because we needed something big, but didn't want to buy too many of the same plants. They may end up being transplanted to the other side of the yard next year. I absolutely love these holly trees! I kind of wish we had continued these down the fence line, but they were a little pricey. If they're still available next month at 75% off I may buy several more. I love that they almost cover our neighbor's house. It's so nice to look out the dining room window and see greenery instead of fence and a house so close by. They still need to get a bit taller and grow wider, but it's already a huge improvement. The small shrub with the roses and vincas around it were my idea of a divider between the holly and cypress trees. I'm not so sure that worked out so great in reality! I'm thinking of curving the bed a little more so it's not such a half circle. If I copy it on the other side against the house I'm hoping it may look like the grass is in an oval shape. I still haven't planted anything against the house yet. I'm not sure if I'm up to it this year! This is just a first layer. I'd like to tweak and add more in front of the large trees and shrubs. I decided to get the big stuff in first so we can add privacy from the side neighbors and cover the unattractive fence. To recap, here is the before. It was so worth it to DIY our backyard landscaping. We saved so much money that instead of landscaping one small section we were able to do half the yard. How much did we save? The quote we received for the same landscaping area was $35,000 and we spent $3,000. No joke! Half our budget went to hiring someone to shape the beds and mulch it. We could have saved several hundred more, but we wanted to have it completed in time for our 4th of July party. We decided we were on a roll so we installed a new outdoor speaker system for the patio and saved 70% there. It was already pre-wired so it really wasn't difficult at all. What's in store for next year? I mentioned I'd like to landscape the other side of the yard and it's what I'm most excited about. I'm going to create a formal garden! It's something that I've always wanted. I'm a little nervous because it's so different from anything I've ever done. At least the yard on that side is less challenging because there aren't privacy issues or weird lot angles to disguise. I've got a year to draw it out instead of just grabbing what was on hand at the garden center with no plan!